Blessing Glass Writing Boards ship worldwide. Our tempered glass writing boards are used in many settings other than offices. They're featured in hospitals, medical facilities, factories, restaurants, schools, colleges, universities, government facilities, branches of the armed forces and residential homes. If you can think of a use for a visual display dry erase board, we at Krystal Writing Boards Inc can customize a glass marker board that will fit your needs. These dry-erase and wet-erase boards are made with white writing surfaces for easy note-taking. They contrast dramatically with almost any ink color, so you can use different shades to organize your information. Many whiteboards come with built-in trays to keep markers within easy reach. 1) Plastic corner protectors are used on each corner of the whiteboard. 3) 2 styrofoam boards, thickness 15 mm, being put on and under the whiteboard, one each side. And then tightened by scotch tape. 4) Load into a 5 layer corrugated carton box, with four size styrofoam protected. 5) Carton packed by PE Tape. We’ve had, at present, the most advanced Glass Whiteboard production lines. 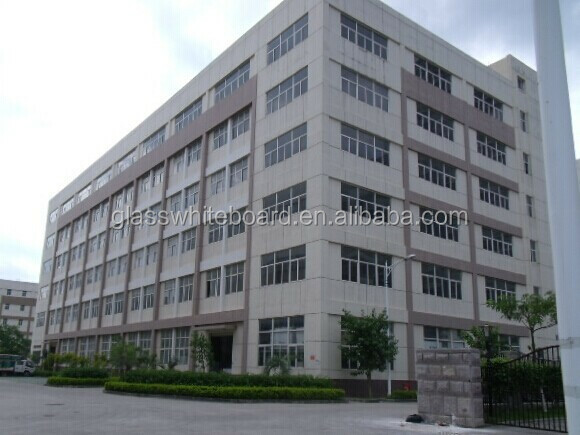 We are leader in Glass Whiteboard area around the world. We have already had close cooperation with world top-level companies, like Headquarter of US Microsoft Cooperation, Pepsi Co., Inc, LG Display Co., Ltd, Haagse Hogeschool (Holand), Vrije Universiteit Amsterdam, etc.